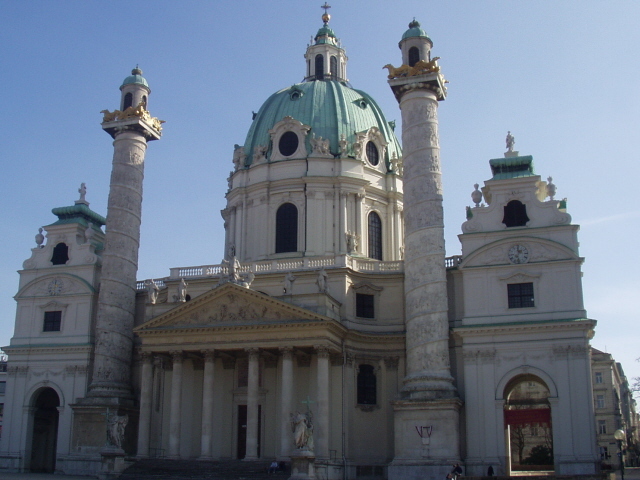 The capital city of Austria – and in fact the country's only big city. One of Europe's great cultural places and accordingly a popular tourist destination. And for the dark tourist too it's one of the world's most rewarding cities to visit. 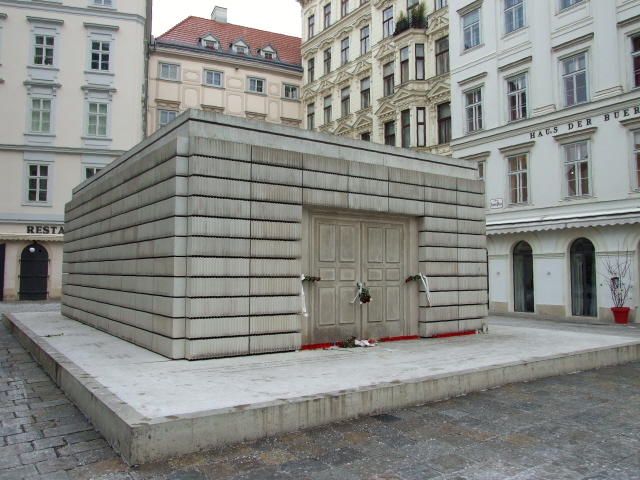 Some of its dark sites are top of the list in their respective categories (cemeteries and medical exhibitions in particular), others are even unique to Vienna. It is without any doubt a must-do destination for any serious dark tourist. It also happens to be the city where I live – so I can offer the most direct services/consultation here. More background info: Bill Bryson once wrote (in "Neither Here Nor There", p. 261) that if Martians came to Earth they'd "unhesitatingly land at Vienna, thinking it the capital of the planet". And in certain parts of the city the amassed grandeur of the buildings certainly supports such a notion. But of course that's only one side of Vienna, and it's only visual. It applies most along the famous Ringstraße, the loop around the inner city centre, esp. the south-western section between the Rathaus ('city hall') and Schwarzenbergplatz, and most grandly of it all at Heldenplatz. Indeed, Vienna used to be the hub of a huge empire, esp. the Austro-Hungarian one. Imperial roots go back much further – the Romans founded a military camp/city here ca. 2000 years ago, and in the 16th and 17th centuries, Vienna nearly fell into the hands of the Turks' Ottoman empire, who laid the city under siege twice – but eventually were defeated. 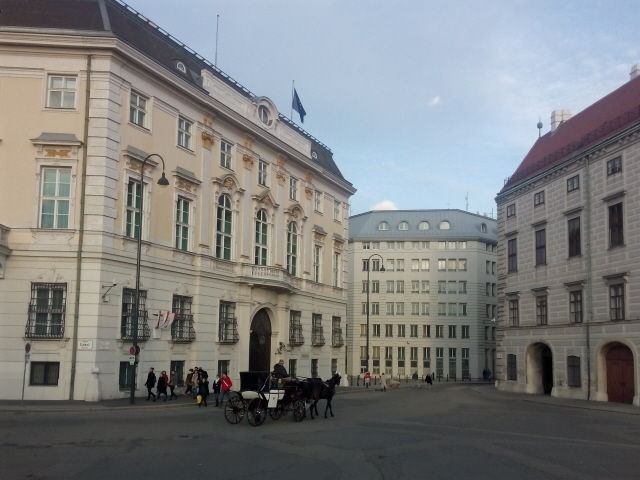 The city really came into its own as an empire's grand capital under the Habsburgs reign in the 19th century. Accordingly, many of the grandest representational buildings along the Ring and on Heldenplatz date from the Habsburg imperial period, especially from the latter days of it at the beginning of the 20th century. Once again, Austria became part of an empire, this time the Third Reich – after Adolf Hitler annexed his old home country in 1938, though he called it "Anschluss" (which sounds much more harmless in German, almost like 'accession'). 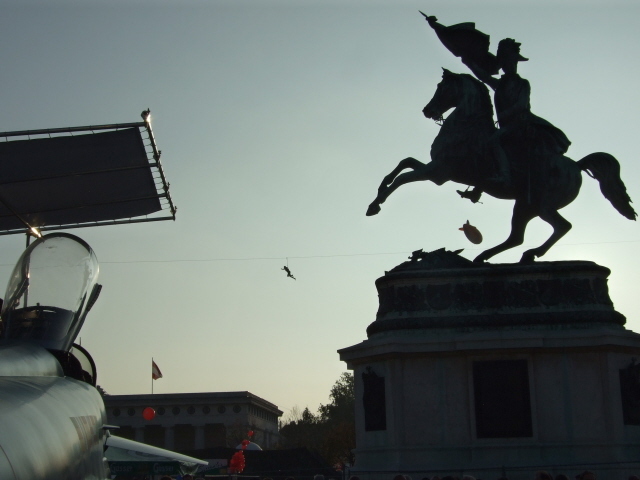 However, a large proportion of Austrians had hoped for exactly this – which is well exemplified in the footage of the cheering crowds on Heldenplatz as Hitler announced the "Anschluss" from the balcony of the Neue Burg palace. With this phase came the full nastiness of the Nazi reign of terror, including persecution and eventually deportation of esp. Jews (the Holocaust). WWII came and with it bombing raids by the allies. After the war was lost, Vienna was, just like Berlin, split between the four victorious powers into four sectors, echoing the division of the whole country into four occupation zones. Again just like Berlin, Vienna as a whole found itself an island within the Soviet occupied zone, while the USA, Britain and France each also retained a foothold in the capital – the central 1st District was even shared by all four occupying powers. The classic movie "The Third Man" depicts this phase in Vienna's post-war history well – complete with Military Police patrols with four differently uniformed representatives of the four powers who, in the 1st District, always had to share a jeep (hence called the "four men in a jeep" phase). Unlike Germany (and Berlin), however, Austria did not remain divided for so long. With the Austrian State Treaty of 1955, the country regained its unity and independence – albeit under the concession of military/political neutrality in the East-West confrontation (see Cold War). Geographically, Vienna was now almost stranded on a peninsula of the West dipping deep into the Eastern Bloc. 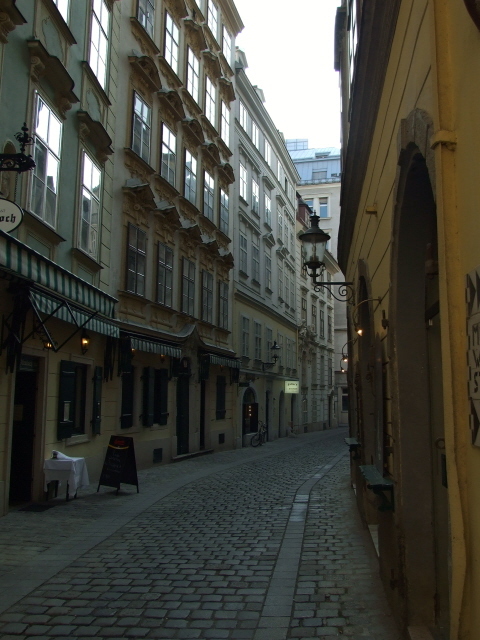 With this semi-isolation, Vienna became a much quieter place, esp. compared to the days when it was the hub of an empire. But the city has come a long, long way from the grim, sleepy place it apparently used to be not so many decades ago. (That's what Austrians themselves told me! Over the last decade or so, however, I haven't personally noticed any dramatic further changes of that sort). Still, a buzzing metropolis like London, Paris or New York it is not. For starters, Vienna is much smaller. In fact, unlike most other metropolis capitals in the world Vienna's population has shrunk compared to older, more glorious days. That has its advantages, though: the city is much more walkable, it doesn't take hours to get from one end to the other, living (and housing) costs aren't as crippling, and the overall atmosphere isn't as stressed and hectic as it is in the really BIG cities of the world. That said, Vienna is still Austria's political, administrative, cultural, well, everything hub. In that sense it is a bit like it is with Paris and France or New York and the USA. It's not really part of the country, it's a separate entity, very different from the rest of the land it functions as the capital for. Get out of Vienna a few dozen miles and you instantly feel you're in the middle of real provincial dreariness. Back in Vienna, it's quite cosmopolitan and metropolitan after all … albeit in a relaxed sort of way. All this combines to make a standard of living that has seen Vienna take top marks globally as one of the most liveable-in cities (at the point of writing this it's even the No. 1 on both the Economist's and Mercer's list – but it has consistently been amongst the top three or four for the last few years). Obviously, that's something that the Viennese are justly proud of. As for me, as a foreigner in Vienna, I'm quite happy to live here too. I especially value the contrast of a good degree of internationalism on the one hand, and quirky "quaintness" on the other. A German saying goes "death must be a Viennese" – and indeed, the city's "special relationship" with the topic of death is legendary. This also has an impact on dark tourism: nowhere else are there this many places devoted to death, or at least the morbid, as in Vienna. Cemeteries aren’t just graveyards in Vienna – they're culturally celebrated places. The same goes for several crypts and catacombs. Funerals are handled by a near monopoly municipal company that not only offers the widest imaginable range of services (including that of pressing the ashes of a cremated loved one into a diamond, which a widow/er could then wear …), it also opened the world's first funeral museum! Even the military history museum goes beyond the usual glorification of the armies of old by incorporating the odd distinctly morbid element into its exhibition. And at least a certain morbid edge is also present in Vienna's world-class medical exhibitions. In comparison, Vienna's darkest modern-age period, in the 20th century, i.e. esp. the Nazi era, is somewhat underrepresented. The odd exception notwithstanding, this part of the city's history is left more or less totally undeveloped for tourism. (Habsburg grandeur is shown off with much more enthusiasm – and nobody seems keen to remind overseas visitors of the fact that Hitler was in fact Austrian, not German). 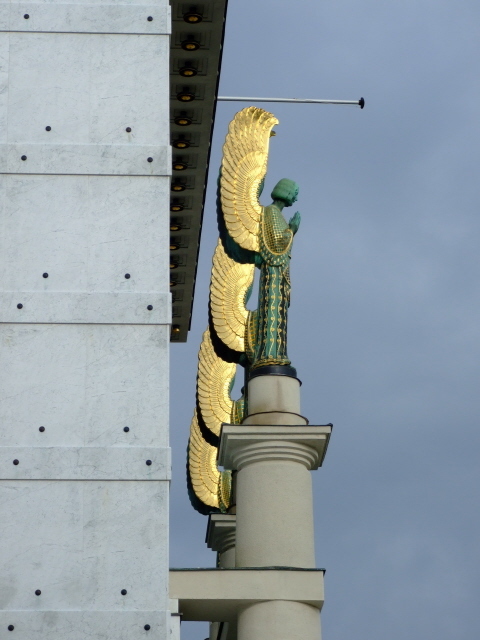 But even in their completely uncommodified state, the Flaktowers in Vienna are unique relics from those grim days. Finally, the period directly following WWII is covered (at least in part) by the touristic exploitation of the legend of the movie "The Third Man". 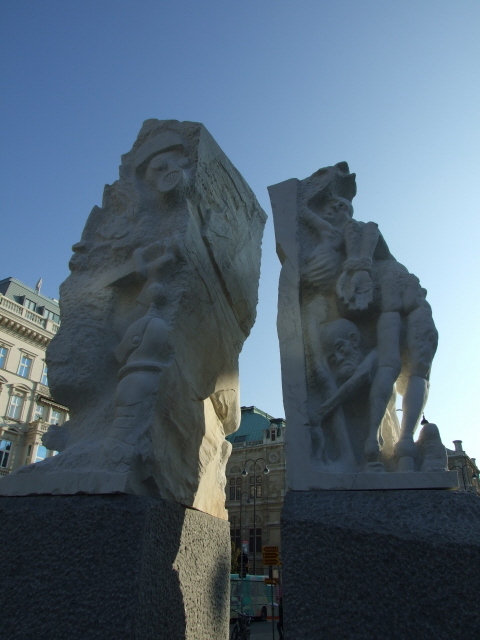 Probably the most notable anti-war memorial is that by the controversial artist Alfred Hrdlicka which stands opposite the Albertina near the Opera in the inner 1st district – it’s a particularly controversial piece for its artistic execution but certainly worth a look. 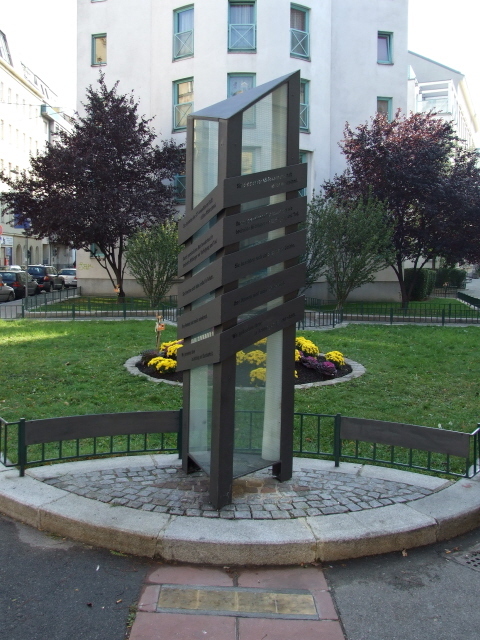 Larger, but still fairly secluded is the monument to the victims of fascism on Morzinplatz, off Franz-Josef-Kai, near Schwedenplatz – this marks the spot where the Vienna Gestapo HQ offices used to be. A small, easily overlooked memorial in a hidden corner inside Westbahnhof station commemorates the Jewish children who were evacuated from here to Great Britain. More notable is the monument commemorating the Holocaust that stands in the middle of Judenplatz (literally “Jews Square”!) right in the centre of the city. The name derives from the fact that this area used to be a Jewish quarter in the middle ages – until its destruction in the 15th century. This part of history is commemorated in the Jewish Museum on the edge of the square – but it does not cover any of the even darker episode of Jewish history in the 20th century. 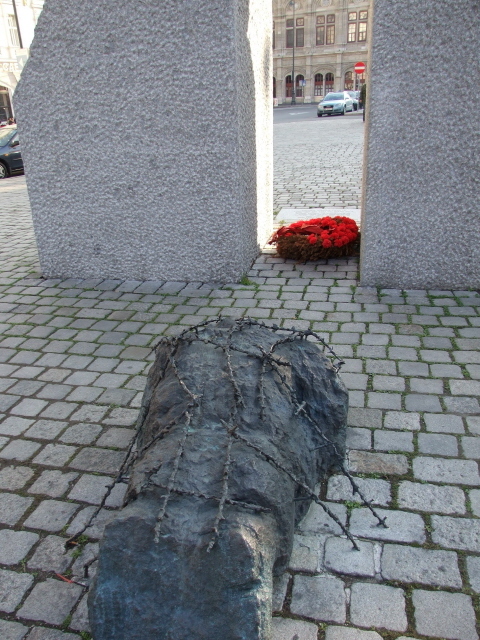 This is instead left to the monument in the square. At first and from a distance it looks like a small building of some sort, but on closer inspection you find that its white walls are shaped like bookshelves – and at their bottoms the names of various concentration camps, death camps and ghettos are set into the ground. 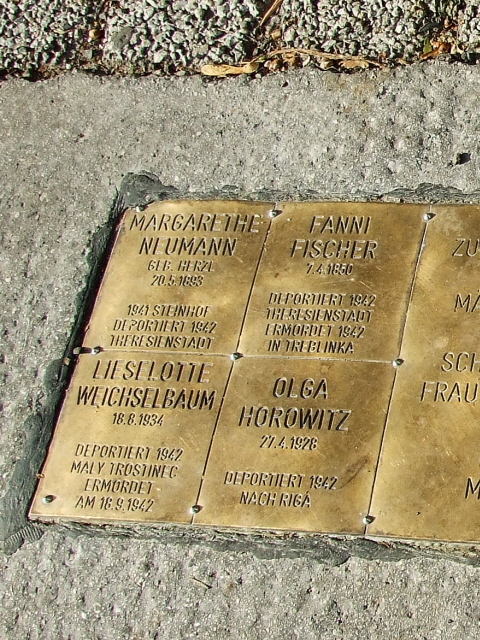 More plaques and small memorials, marking lost synagogues or notable individuals, can be found in Vienna's 2nd district, which today is (again) Vienna's main Jewish quarter (albeit on a much smaller scale than pre WWII). 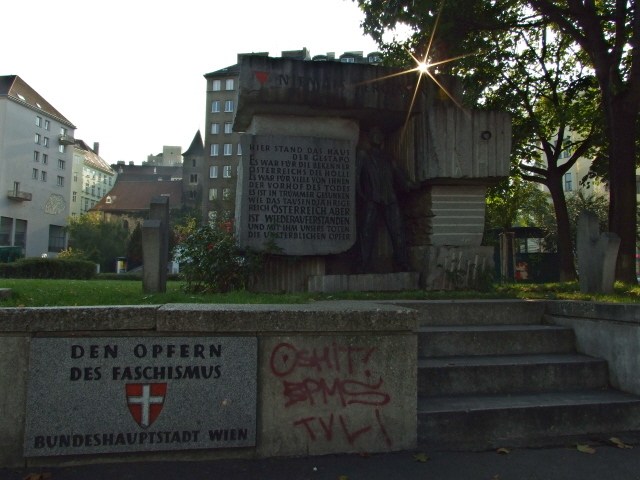 A so-called "Weg der Erinnerung" ('Path of Remembrance') connects various monuments, 'stumbling blocks' and plaques, e.g. on houses where in the past a synagogue used to stand. 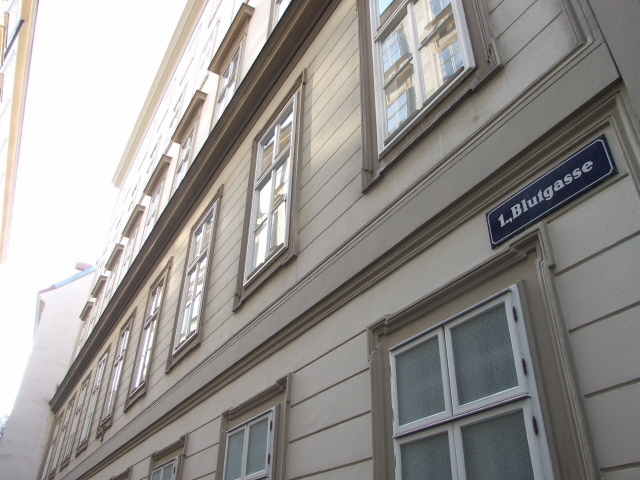 Similar themed routes for historical walks in the footsteps of former Jewish life in Vienna have been developed in the 9th district. 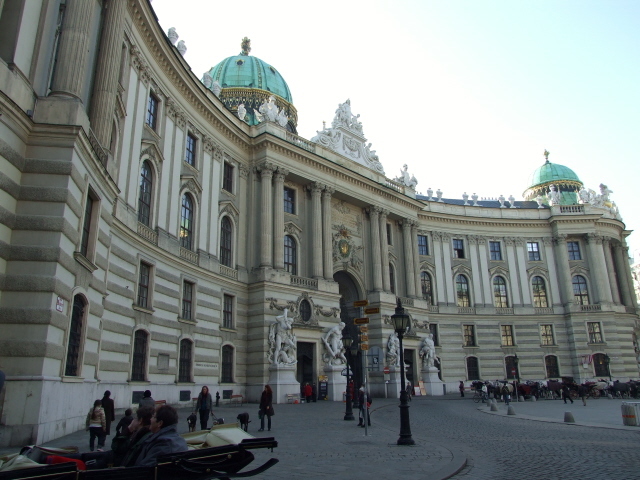 Those who get something out of following Hitler's footsteps could take a look at the main central balcony of the pompous Neue Burg wing of the Hofburg palace complex overlooking the square Heldenplatz. This is the spot where the little great dictator proclaimed the "Anschluss" of his homeland to the Third Reich … to the cheering of countless assembled Viennese below, i.e. where you'd be standing when looking up to the balcony. A perhaps suitable end- and counterpoint to all this can be seen in the Soviet memorial at the far end of Schwarzenbergplatz set up shortly after the Red Army had taken Vienna in 1945. And to offset (or – to the utterly twisted mind – even complement) any Soviet hero-worship, search out that most bizarre relic from Vienna's Soviet associations: at Schönbrunner Straße 30 a wall plaque with a relief of Josef Stalin marks the place where the man who was later to become the infamous Red Tsar of the USSR (and Hitler's prime adversary) used to stay and work for a brief period in 1913. Location: in the far east of Austria, near the Danube river (though hardly "on" it), less than 40 miles (60 km) upstream from Slovakia's capital Bratislava, some 150 miles (250 km) downstream from the German border at Passau; and a bit over 220 miles (350 km) east of Munich. 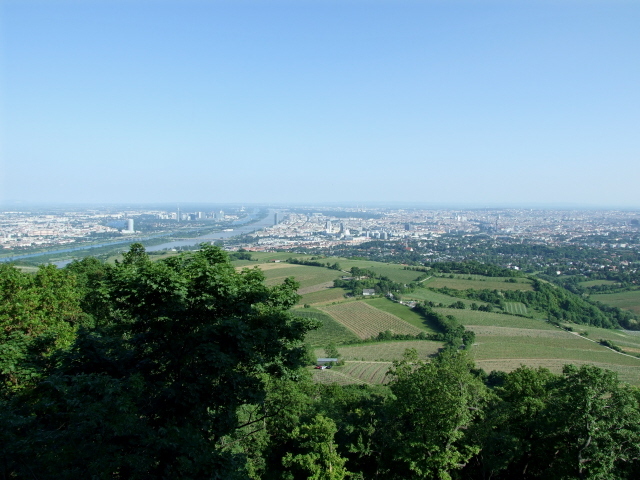 The hills surrounding part of Vienna to the west and north are actually the final foothills of the Alps. Eastwards begin the plains that eventually become the Puszta of Hungary … Budapest is just a good 130 miles (210 km) south-east. Note that since Austria was (all military neutrality notwithstanding) de facto part of the "West", it's easy to forget just how far east Vienna is actually located geographically – it's actually a bit further east than Prague, which is ca. 160 miles (260 km) north-west of Vienna. Access and costs: east of Central Europe, but easy to get to; price-wise quite variable. Details: Vienna is easy to get to by plane, train, car, bus – and even on waterways: there are fast boat connections to Bratislava and Budapest (and river cruise boats e.g. from Passau, Germany, pass Vienna too). Trains are a particularly good option, with lots of connections in all directions, which can be astonishingly cheap when booked in advance. Flights too can be quite affordable, even when using Vienna's Schwechat airport. NOTE: some cheap carriers selling flights "to Vienna" may not actually use Vienna airport but Graz or Bratislava (Slovakia), which means a lengthy transfer before you actually get to Vienna. When searching for flights to Schwechat, use the code VIE. From Schwechat airport you can easily get into the city by regional metro train (S-Bahn), which is by far the cheapest option (two zones, currently 4 EUR for a single ride). The heavily advertized commercial city-airport train (CAT) takes exactly the same route, and is only about 10 minutes faster (no stops en route), but costs significantly more. Both go to Landstraße/Wien Mitte, which is just east of, so not actually "in" the city centre. The S-Bahn continues to Praterstern, which can also be a useful interchange. Airport buses go to the train stations Meidling Bahnhof (at Wien Dörfelstrasse) and Westbahnhof (with plenty of good connections) or to the city centre at Schwedenplatz. But if you take the S-Bahn to Landstraße or Praterstern you could also carry on on the metro (U-Bahn) from there to Westbahnhof or Schwedenplatz respectively, and that on the same ticket (! ), and thus save money. Within Vienna, an excellent public transport system ensures that virtually every corner of the city is within easy and quick reach. The pricing system for tickets is also remarkable. There's a flat rate for single journeys of any length, unlimited changing included (as long as the route taken is sensible – i.e. not in wide circles or zig-zags). You can either buy single tickets or strips of 4 or 8 (same price per journey). Stamp your ticket in the blue boxes provided either by metro entrances or on board buses and trams. There are also 24- or 72-hour tickets, as well as weekly and monthly passes allowing unlimited travel within Vienna. The 8-day ticket may be particularly useful as it's flexible as to which days you use it (say, if you have two days in the middle on which you'd only walk) – just stamp one strip per day/person on the day you want to travel, and it allows unlimited travel on that day (calendar day, that is, so not 24 hours from stamping). Accommodation options in Vienna cover the full range, from world-famous luxury hotels such as the Imperial or the Sacher, a large number of mid-range places, and a few budget options too (esp. the so-called Pensions). Lots of budget to mid-range hotels are clustered in not quite so attractive parts of the city (esp. south of what used to be the Südbahnhof station, which is currently being reconstructed as Vienna's future main station, or along/off Landstraßer Hauptstraße heading east, i.e. away from the city centre). When searching for accommodation don't be fooled by places advertising a "central" location – quite often it isn't that central and/or the area may not be so nice. Good districts to look for when checking locations are, apart from obviously the inner 1st district, the 6th, 7th, 8th, and 9th, in part also the 2nd (though not all of it). 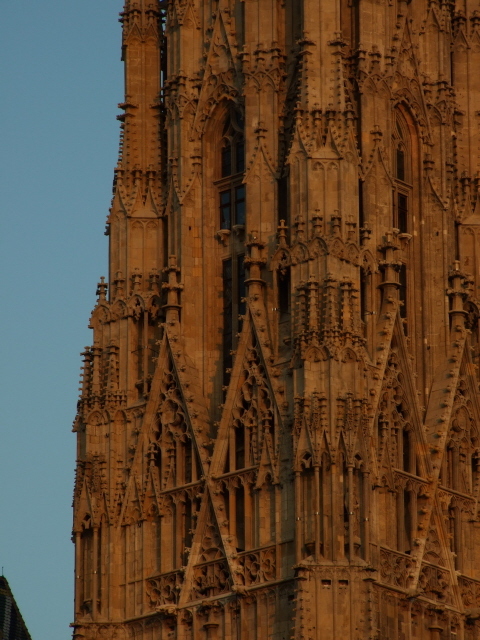 If you'd like more consultation on (almost) anything Viennese, contact me. Time required: To see all the dark sites alone, you'll need a bare minimum of at least a week (if you don't mind tight itineraries – better allow two weeks or more). Add more time to see some of the non-dark bits too – and not just the standard places all the tourist hordes flock to; see under non-dark combinations for a few suggestions. To really "do" Vienna intensively and more or less exhaustively (if that's possible), you'd need at least two to three weeks, then, or even longer. So either go for that long for a Vienna "to-the-max" experience, or – better perhaps – come back on a couple or so separate occasions. Combinations with other dark destinations: Vienna is also an excellent base for dark explorations outside of the city limits. Most of the other dark sites in Austria can be reached from Vienna on day return trips (at least at a push, when starting early). 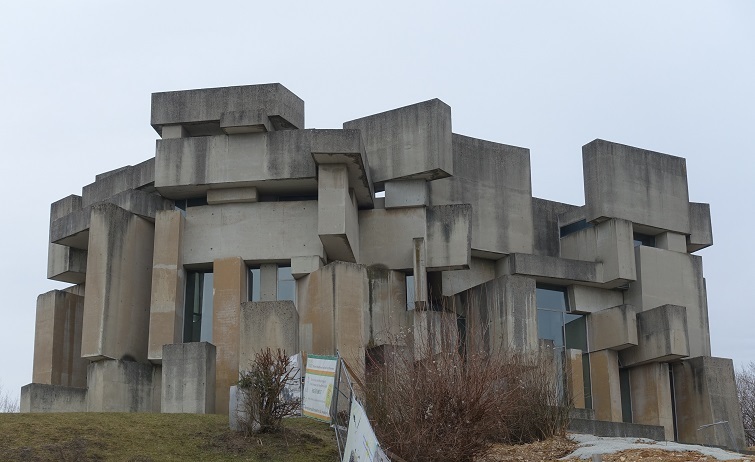 Mauthausen & Gusen are near Linz, a couple of hours' drive away from Vienna. Slightly further away, beyond Linz, is Schloss Hartheim. If you want to do both one straight after the other, you may need to look into staying overnight somewhere in the area. Ebensee can also be reached on a day trip out of Vienna. Only the trip to the Pasterze glacier may be too far to be doable in comfort as a day trip (unless you set off before the crack of dawn and come back late perhaps). There are also significant dark tourism places outside of Austria that can easily be reached from Vienna (though hardly as day return trips). First and foremost: Hungary's fantastic capital Budapest is only a couple of hours away on the train from Vienna (you could even go by boat – at least in the summer). The Czech capital Prague, to the north-west of Vienna, is also within relatively good reach (trains take ca. 4 to 5 hours). The same is true for Munich in southern Germany. Italy isn't far either, bordering on Austria to the south. Next there's the Balkans – also virtually just round the corner, with train and/or bus connections from Vienna to Croatia and Bosnia & Herzegovina. 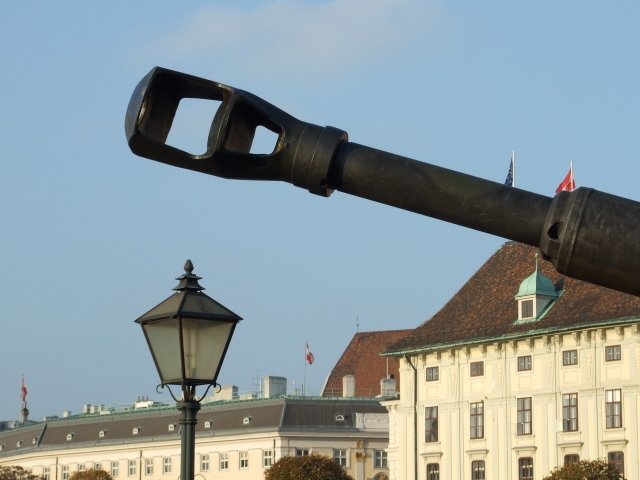 In short: Vienna is not only a prime dark destination in its own right, it also makes for a perfectly located stopover or springboard to a good number of other countries' dark tourism offerings in all directions too. Viennese cafés are world-famous. And some of them are indeed very pleasing to the eye of the beholder, though overall they can disappoint foreign visitors whose expectations may be higher than many of these cafes can meet. OK, there's the usual famously wide range of coffee preparations (though you'll never find just a simple cup, let alone mug, of plain black coffee on the menu – the closest thing to it is the so-called "Verlängerter", a kind of watered-down espresso, but still rather small …). The quality of the coffee isn't necessarily above average. There are newspapers which patrons can grab and browse over their coffees, and some cafes may even have a few English-language ones, which is nice. The waiters are typically, and traditionally, less nice, in fact they can be rather arrogant and snotty. It seems to be part of the job description (and maybe falls under the universally justifying label of "Schmäh" – a special Viennese brand of sarcasm that the non-Viennese person is not expected or even allowed to understand). Many cafes double up as restaurants, esp. for lunch. Some are more minimalistic and may offer only a small selection of cakes. One café to be picked out especially is the rightly famous Café Hawelka (on Dorotheergasse). It's of the minimal type and oozes character – even though one of the most characteristic elements of the Hawelka entertainment, old Josefine Hawelka, unfortunately died a few years ago, leaving her husband Leopold a widower. Recently he passed away too. Still, the place is still dark, full of old world character and often crowded to capacity. But since a recently introduced smoking ban it is thankfully no longer as impenetrably smoke-filled as it used to be. 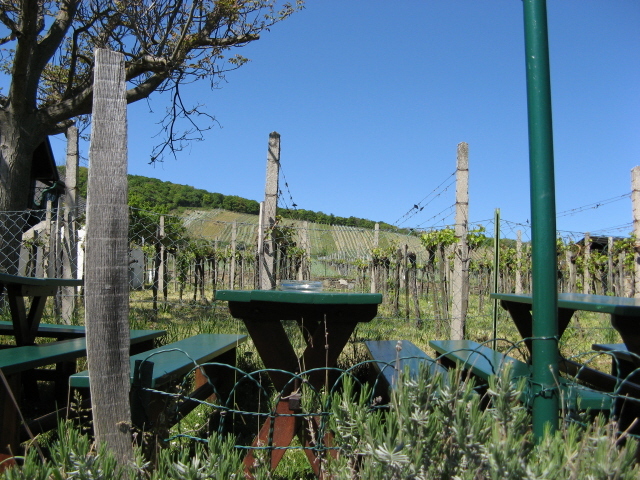 Another famous thing about Vienna are the so-called Heurige – those characteristic wine bars/gardens, some of which are situated right by the vineyards they belong to. Vienna, in case you didn't know, is the only metropolis in the world that has a thriving wine growing industry within its city limits. Some 800 vintners are said to operate their usually small businesses in Vienna. If you want to experience the real thing, try to avoid the ones that are totally geared towards tourists, and where you'll often find more Japanese in large coach parties than actual Viennese. Most of these folklore Heurige are located in Grinzing – but even that area also has some nice original specimens … but you'd need to know where to look for them. I could pass on a few tips – but only on demand (as I don't want those places to become too touristy …); if you're interested, contact me. Those with a sweet tooth will encounter more temptations in Vienna than is healthy – but occasionally these sweet little sins may be just too irresistible, esp. given the outstanding quality the better chocolate makers deliver. Demel is the most famous name here, but e.g. 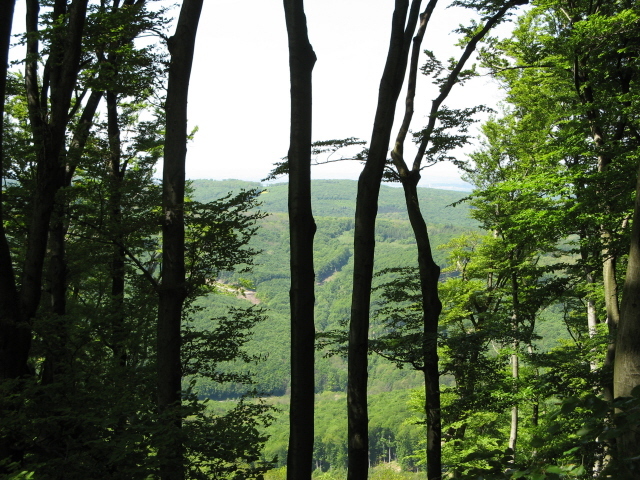 Oberlaa, with many branches across the city, is also highly recommended. In other culinary respects, Viennese cuisine is more geared towards carnivores who love their meat portions large. For (semi-)vegetarians (like myself – see food & drink) it's the many ethnic restaurants that best provide respite from the otherwise limited non-meat choices of the traditional eateries. Again, I could pass on tips (on demand – contact me). Architecturally, there's more to Vienna than just the grand imperial piles on the Ringstraße and Heldenplatz. Vienna was also the hub of Art Nouveau (Jugendstil), and many a glorious example of this can be found all over the city – not just the standard show-off ones such as the Secession building near Naschmarkt and Karlsplatz, even quite functional architecture, such as the arches and stations of the Stadtbahn, now the route of the U6 metro, are masterpieces of the style too. My personal favourite is the Church at the Steinhof hospital complex on Baumgärtner Höhe (see Spiegelgrund). Its marvellous exterior can be viewed at any (daylight) time, but the even better interior is only accessible on guided tours on Sundays at 3 p.m. – highly recommended. Vienna has traditionally "always" had a Social Democrat government – and there are quite stunning manifestations of "Red Vienna" in architectural terms, first and foremost the gigantic "Karl-Marx-Hof" housing estate at Heilgenstadt (by the terminus of the U4 metro line). 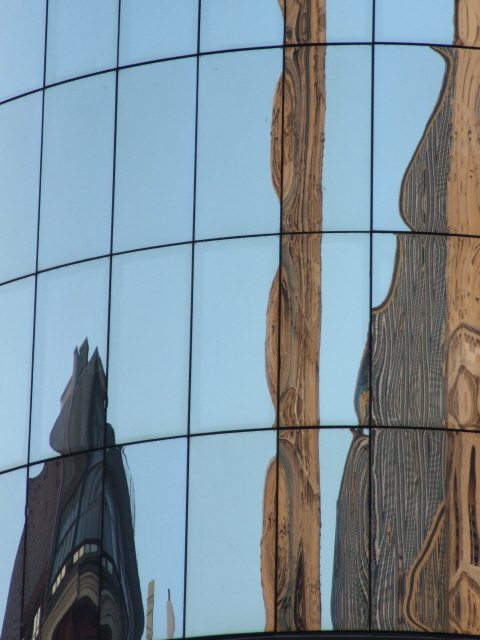 There are also examples of really modern architecture here and there. The most noted and controversial is the Haas-Haus right on Stephansplatz opposite St. Stephen's cathedral (which is visible in distorted form in the curved mirrored facade of the Haas Haus if you look at it from the correct angle) … I for one like this kind of contrast. Another rather cool example is the highest skyscraper in Vienna, the Millennium Tower on Handelskai by the Danube in the 20th district. The Danube, by the way, is nowhere near as blue as the cliché or the Waltz of the same name make people expect it to be. In actual fact, the colour of its waters is rather a kind of milky greyish green. Only some parts that are cut off from the river proper by flood regulation dams can appear blue (on sunny days, when the sky is blue). Another potential misconception may require clarification: Vienna is only technically speaking "on" the Danube – but it only cuts through the north-eastern outskirts and most tourists will never see it. Instead, many people unaware of the actual size of the mighty river may mistakenly believe the narrow Danube canal to be the "river". It's not. It's just an artificial canal, although it connects with the real Danube – you can even go on river cruises from the canal. From the actual Danube – or the riverbank – you can see the modern complex of and around the UNO City. The United Nations set up one of their main European branch seats in Vienna in the 1970s. Guided tours are offered there too. Vienna has more green bits than most other big cities in the world. 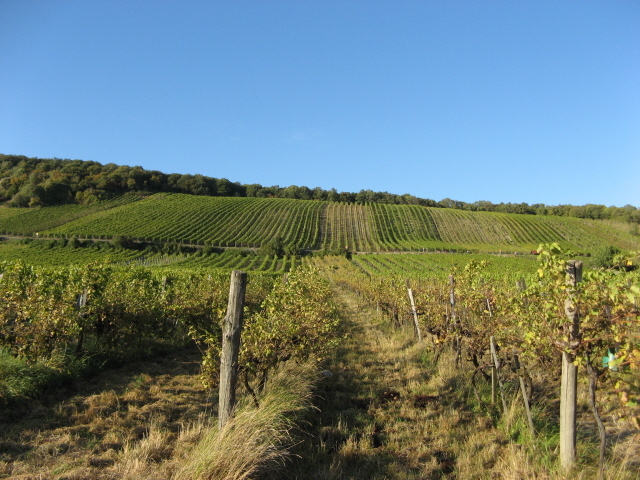 The famous Wienerwald (Vienna Woods) is a semi-circle of extensive forested hills to the south and west of the city, but still within its city limits (most of the vineyards are located here too). You could hike for days, if not weeks, in these hills without ever repeating a route and without ever leaving Vienna's boundaries. More nature, albeit in the form of captive fauna, can be found in Vienna's excellent Schönbrunn zoo. It's the oldest zoo in the world, but at the same time these days one of the most modern ones. More animals, albeit not at all animate ones, can be seen in the enormous collection of stuffed specimens in the Natural History Museum on the Ring. This wonderfully old-fashioned museum is the symmetrical counterpart of the Art History Museum opposite, which is famous for its collection of old paintings by stock biggies such as Rubens or Bruegel. Those who (like me) like their art a little more modern should head just to the south-west of the two grand old museums, to the "Museums-Quartier", where the "Mumok" is located – the Museum of Modern Art. Its most dramatic exhibit is arguably the building itself, which is made from stark grey volcanic rock slabs. 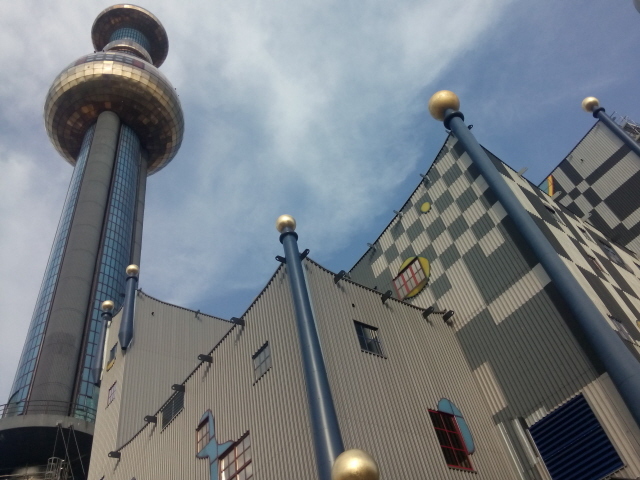 The view from the outside is free … admission to the inside is 9 EUR (6 EUR for students up to the age of 27). Vienna is also chock-full of quirky small museums, unusual little gems way off the tourist mainstream, without necessarily being dark at the same time. But if you fancy bizarre things such as a marzipan museum, a clock museum, a museum of fake art, even a brick museum (sic! 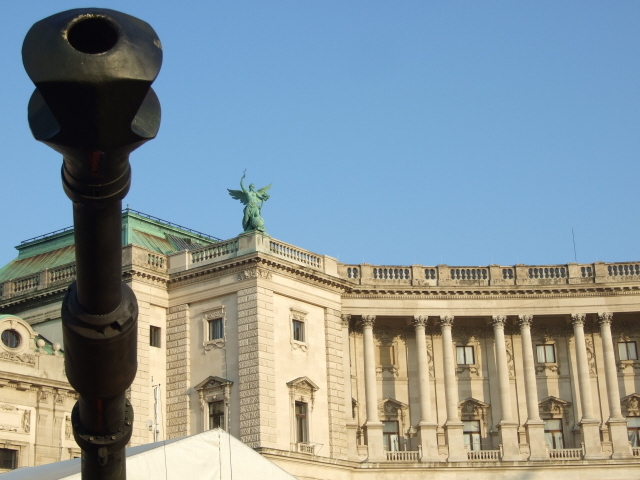 ), then Vienna has so much more to offer the open-minded visitor. There is even, believe it or not (well, do!) an Esperanto Museum – the world's only such museum entirely devoted to this and other artificial languages (they even offer a crash course in Klingon! ).